The Moya Hawaiian cloth. Well let’s see where do I get started, there are so many great things to say about this Gi. My initial thoughts when I first opened the Gi was just “WOW” it’s a beautiful Gi, high quality, design and stitching is great. I fell in love with the Gi right off the bat. Opening the Gi first thing I noticed was how awesome and detailed the patch on the lapel was, it’s a flawless Gi that you truly appreciate and makes you not want to train in. The top is really light, thick lapel, the pants are light; perfect for summer training or competing in ibjjf tournaments where you weigh in right before your first fight. Well first let me say, I am 5’9 about 150lbs , it is really hard for me to get a Gi that actually fits right since I’m lanky. Some Gi companies I’m an A1 or an A2, they either fit too small or too big. Well let me say this was the goldilocks Gi for me. It was just right, the fit of the A1 was perfect , didn’t need to shrink, pants and top were awesome. I’ve had it for about a month now, and its sizing remain the same, I cold wash air dry(in my house not the sun) and it drys in a day or less, which is surprisingly fast unlike my other Gis, so it comes in handy when you train 2 times a day every week. For those of you that would like to shrink the Gi, yes they do shrink since they are 100% cotton. White with Red Contrast stiching, is great color. Every design on this Gi is extremely detailed, phone booth kris, is a true genius when designing Gis. 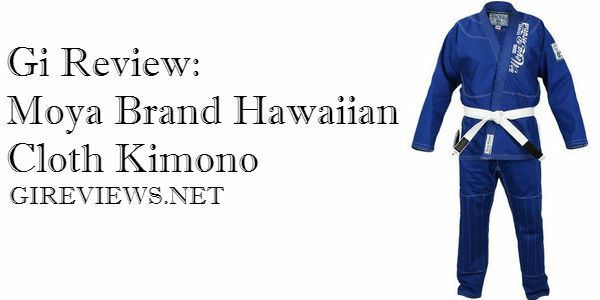 The blue and red design and Hawaii theme makes a beautiful colored Gi. Makes you not want to use it, and just walk around your house like I did when I first purchased (Glad somebody else has done this ~ Brendan). The embroidery on the bottom back of the jacket and top on the back is a cool touch to it, especially the Hawaiian islands. The jackets fit is great like i said earlier, the stiching is perfect and flawless, no loose threads, real light top great for competitions and summer training. The pants are some of the lightest and best quality pants I’ve had in a while, white with red stiching, the drawstrings are AMAZING and hold up great in the washer since it is higher thread count. I asked Jesse about this and he said since its a higher thread count everything is held together tighter and less likely to fall apart, those of us have owned OTM Gis, know how this is a great thing. Pants hold up great , after washing they probably shrunk less than half an inch (cold wash air dry). I rolled in this Gi once before competing in it. Fell in love with it,my first roll with it was just breaking it in, everything held up, the collar is hard to grip, so when grip fighting it’ makes it easier to break off their grip. Competing in it was great, the Gi had no rips, blood stains come off easily I just use regular detergent and cold water, no fabric softener. Overall this Gi holds up great rolling, real light so you don’t over heat. $200 for a Gi is extremely pricey, but let me tell you it’s probably some of the best money you’ll spend on a Gi. You’re paying for quality. Definitely looking towards Moya’s future releases, I currently own also their bill cooper Gi, phonebooth Kris makes awesome designs. My favorite thing is that their Gis are available year round, they’re great quality and no preorder crap. Definitely looking forward to there new Gi designs. Moya is my favorite brand out right now, believe me purchase one and you’ll see why. For more information on Moya Brand’s gis other than the Moya Brand Hawaiian Cloth kimono , click here. The Moya Brand Hawaiian Cloth kimono is made of 450 Gram Pearl Weave. The Jacket is similar to a single weave and the jacket and pants both have red contrast stitching. The collar is made of EVA foam and all seams are triple stitched. The Moya Brand Hawaiian Cloth kimono pants are very very thin and lightweight and are made of 10-ounce cotton. They should only be used for competition. There are 4 belt loops on the pants and the gi comes with a white belt. That’s a really good looking gi! This isnt a review. Its more like a paragraph and a picture. More substance please. I totally agree, bilbo. We’ll be adding a more thorough review in the coming weeks! What size did you get?….. You said your 5,9 150…. those also are my measurements and I to have the same problem with A1 being to small and A2 being to big…. So what size did you end up getting…. A1 or A2? So which did you go with, A1 or A2? Said you were deciding between the two, but didn’t mention which you decided on. Thanks for the comment, Mike! Ruben went with an A1. We added it into the article. And it is a very sharp gi. Probably my favorite of all of their gis, except maybe the DeCart in black. I love the oversized lapel patch.